Throughout the country, the arts are pumping new life into the bodies and minds of the elderly. Two summers ago, a remarkable documentary called “Alive Inside” showed how much music can do for the most vulnerable older Americans, especially those whose memories and personalities are dimmed by dementia. But once she was fitted with an iPod that played the music she had enjoyed in her youth, her smile grew wide and her eyes sparkled as vivid memories flooded her consciousness. She was now able to describe in detail the music and dances she had relished with her young friends. At another nursing home, a man named George with advanced dementia refused to speak or even raise his head when asked his name. He too was outfitted with an iPod, and suddenly George came back to life, talking freely, wiggling to the music in his wheelchair and singing along with the songs he once loved. The Music and Memory project that provided the iPods was the inspiration of a volunteer music lover named Dan Cohen, and has since spread to many nursing homes and facilities for the aged around the country. Alas, not nearly enough of them. Medicaid, which fully covers the cost of potent drugs that can turn old people into virtual zombies, has no policy that would pay for far less expensive music players. So the vast majority of nursing home residents who might benefit are deprived of this joyous experience. Nonetheless, across the country, the arts in their myriad forms are enhancing the lives and health of older people — and not just those with dementia— helping to keep many men and women out of nursing homes and living independently. With grants from organizations like the National Endowment for the Arts and the National Institute on Aging, incredibly dedicated individuals with backgrounds in the arts have established programs that utilize activities as diverse as music, dance, painting, quilting, singing, poetry writing and storytelling to add meaning, joy and a vibrant sense of well-being to the lives of older people. His buddy at the residence, Sally Connors, an 82-year-old former schoolteacher, surprised herself by writing and directing a screenplay that was performed by fellow residents. Then, with Dolly Brittan, 79, a former early childhood educator, they both surprised themselves by writing their life stories in rap and performing their rap memoirs on a stage for at-risk teenagers they were mentoring. Both she and Ms. Connors said their newfound involvement with the arts has made them feel decades younger. Tim Carpenter, the executive director of EngAGE, is now working to expand this approach to senior living in other cities, including Minneapolis, Portland, Ore., and Raleigh, N.C. His goal is to create a nationwide network of programs for seniors that keep them healthy, happy and active through lifelong learning in every conceivable art form, enabling them to live independently as long as possible. As in Burbank, Mr. Carpenter is promoting the development of arts colonies in senior residences where residents can study and create art in all its forms and where they can see their artistic creations come to life on a stage. Dr. Gene D. Cohen, a gerontologist at George Washington University who died in 2009, was a staunch advocate for the mental and physical benefits of creativity for the elderly. He directed the Creativity and Aging Study, a controlled study sponsored by the National Endowment for the Arts at three sites, including Elders Share the Arts in Brooklyn, N.Y., that showed after only a year that the health of elders in the cultural groups stabilized or improved in contrast to a decline among those in the control groups. In a film called “Do Not Go Gently,” Dr. Cohen, who founded the Creativity Discovery Corps, featured an architect who, at age 96, submitted a plan for redeveloping the World Trade Center site. Dr. Cohen pointed out that creativity challenges the mind and results in the formation of new dendrites, the brain’s communication channels. At 26 different facilities in the Washington, D.C., area, 15 teaching artists work with seniors in centers where they live or visit regularly. 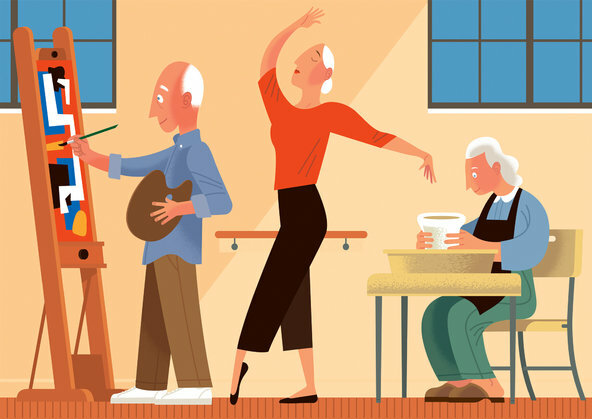 Janine Tursini, director of Arts for the Aging in Rockville, Md., seeks to “get at what best jazzes up older adults.” Groups of about 20 older adults get involved in what she calls “art making” — music, dance, painting or storytelling. Ms. Tursini said the N.E.A.-sponsored study showed that when older people become involved in culturally enriching programs, they experience a decline in depression, are less likely to fall and pay fewer visits to the doctor. In another study among people with Alzheimer’s disease, a sculpting program improved the participants’ mood and decreased their agitation even after the program ended. Social engagement, which nearly all these programs provide, has been repeatedly found in major population studies to prolong life and enhance healthy aging. Clinically, the programs have been linked to lowered blood pressure, reduced levels of stress hormones, and increased levels of the “happiness hormones” that are responsible for a runner’s high.